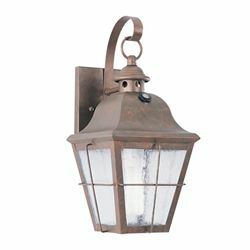 This distinctive lantern offers antique styling and a rustic copper finish. It includes clear seeded glass and an integrated photocell to prevent operation during daylight hours. The fixtures uses one 13 watt fluorescent lamp that is equivalent to a 60 watt conventional incandescent light bulb. The finish is weathered copper on a solid brass housing.